Over the years, anatomists have discerned basic anatomic principles that are applicable to the understanding of the structure and function of the superficial “soft tissues” of the human body including fascia, tendon, muscle, enthesis and nerve. Musculoskeletal ultrasound affords an inexpensive, high-resolution, dynamic, real-time, safe and well-tolerated imaging modality to visualize these tissues. The purpose of this article is to apply these anatomic principles to the ultrasound image of these structures and enhance the fundamental anatomic understanding of practitioners of musculoskeletal ultrasound. Artefacts in musculoskeletal (MSK) ultrasound (US) comprise artefacts that mimic an abnormality while scanning normal structures and artefacts that occur together with abnormal conditions at grey-scale and Doppler imaging. Some of these can be avoided by correct scanning technique while other artefacts are the result of inherent characteristics of different tissues which may help in making a correct diagnosis. The origin and examples of common grey-scale and power/colour Doppler artefacts in ultrasound are explained with particular reference to MSK ultrasound. The commonly encountered Doppler artefacts such as the flash/twinkle artefacts and pseudo flow artefacts and their importance for image interpretation are discussed. 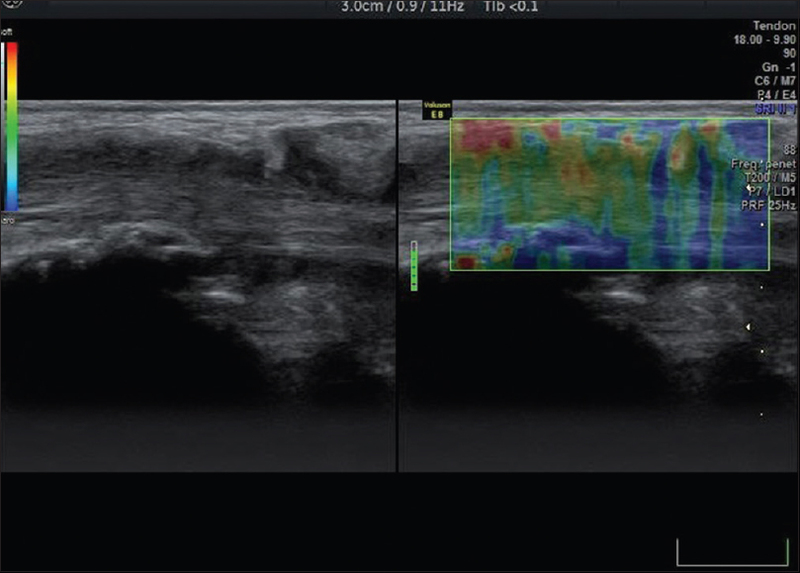 Anisotropy is the sonographic artefact that is direction dependent and can be mistaken for a partial tear while scanning a tendon or nerve. Aliasing and random noise are well known artefacts, which depend upon grey-scale and overall gain. Mirror image artefacts refer to any highly reflecting smooth surface which may act as an acoustic mirror. In rheumatology, the mirrors will nearly always be bone surfaces. Blooming artefact displays colour outside of a vessel and makes vessels appear larger. 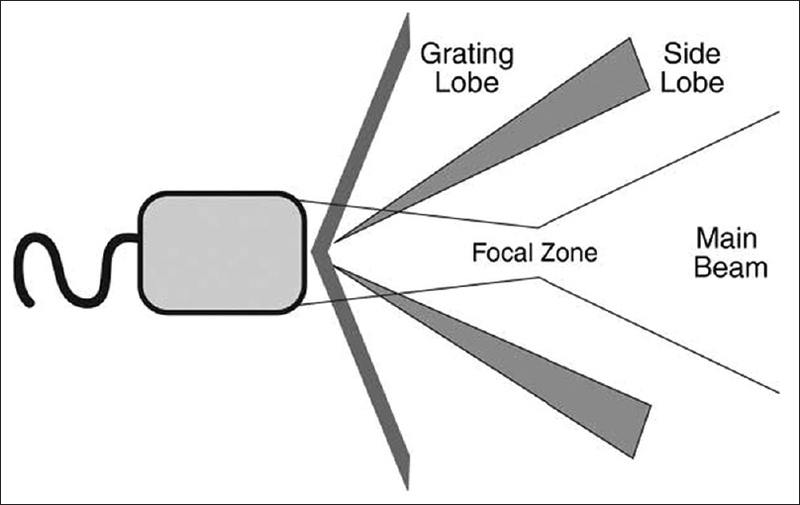 Artefacts can also be due to ultrasound beam characteristics (side-lobe artefact), multiple echoes (reverberation, comet-tail, and mirror artefacts), and attenuation errors and enhancement, among others. Not all artefacts are confusing or unwanted. Certain artefacts are beneficial in assisting with the diagnosis. A better understanding of proper imaging techniques will allow correction or minimization of many of these artefacts. 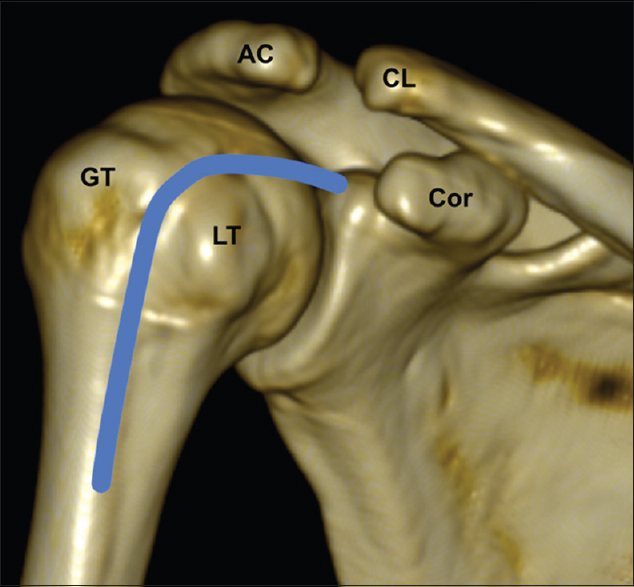 Knowledge of the anatomy of the shoulder and its periarticular soft tissues and scanning techniques are essential for successful ultrasound (US) examination of the shoulder. Inflammatory conditions or overuse injuries affecting the periarticular structures are the most common causes of nontraumatic shoulder pain. Dynamic imaging with US is an added advantage and scores over similar cross-sectional imaging modalities. In a routine US examination of the shoulder joint, the extraarticular segment of the long head of biceps, rotator-cuff tendons and their muscle bellies, rotator interval, subacromial-subdeltoid bursa, posterior joint recess, and the acromioclavicular joint are assessed systematically. With the advent of musculoskeletal ultrasound (US), there has been a paradigm shift in the way rheumatological conditions are detected, quantified and managed. Small joints of the wrist and hand play an important role in the diagnosis and characterization of inflammatory arthritis. Successful scanning of the wrist and hand requires good scanning equipment, thorough knowledge of anatomy and scanning protocols. The dorsal recesses of the wrist, metacarpophalangeal joint, proximal interphalangeal joint and the distal interphalangeal joint are scanned to look for joint effusion, synovial hypertrophy and cortical erosions. The extensor tendons of the wrist and hand have a synovial sheath at the level of the distal radius. The flexor tendons and the median nerve along the volar aspect of the wrist pass through a fibro-osseous tunnel known as the carpal tunnel. US pathologies commonly encountered in inflammatory arthritis have been very well defined in literature, so that there is better reproducibility of the tests and reduction in the inter-observer variation. Recent advances in musculoskeletal (MSK) ultrasound and transducer technology have enabled increased utilization of high-quality ultrasound in rheumatology clinics and by the bedside as an adjuvant to the clinical examination of the hip. Ultrasound is also an integral part of image-guided joint aspirations, injections, biopsies, and bursa injections. 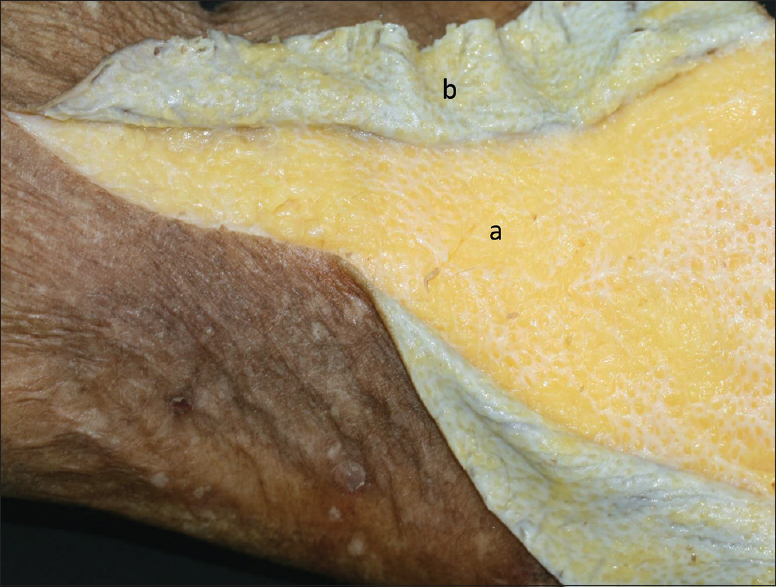 In this article, we will focus on basic ultrasound scanning technique and findings related to common rheumatologic pathologies of the adult symptomatic hip. Transducer positioning and essential sonographic bony landmarks will be reviewed and scanning in two orthogonal planes (both long and short axes of the structure) will be emphasized. Common hip pathologies such as synovitis, joint effusion, bursitis, greater trochanter pain syndrome, and hamstring pathology will be discussed. The reader will also be made aware of limitations of ultrasound in the evaluation of hip and emphasize the complementary role of ultrasound with other imaging modalities (radiographs, computed tomography, and magnetic resonance imaging). The diagnostic ability of MSK ultrasound is based on an operator's training and experience, the patient's habitus, and aptly chosen clinical indications. A good grasp of anatomy, sound ultrasound technique, and knowledge of limitations of ultrasound modality are essential for a safe ultrasound practice. A long-standing commitment of time and resources is needed to become competent and comfortable in scanning. Where possible, the training should be inbuilt into the postgraduate training. It is best that a rheumatologist adopts a career plan of learning, inclusive of MSK ultrasound, relevant to rheumatology. The knee joint, surrounding ligaments, and extensor mechanism (quadriceps and patellar tendon), given their superficial nature, are easily accessible and accurately assessed with high-resolution musculoskeletal (MSK) ultrasound. Its bedside availability, lower cost than magnetic resonance imaging (MRI), and its high sensitivity in the detection of a small effusion, synovitis, and Baker's cyst, together with its ability to be used for needle guidance in invasive procedures, make ultrasound a highly desired diagnostic tool. 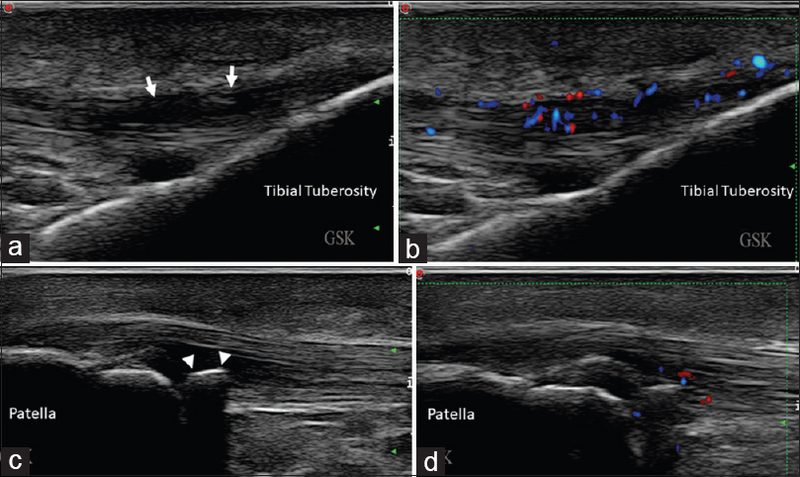 In this article, we will focus on common rheumatologic indications of MSK ultrasound in the knee and discuss scanning technique and sonographic findings. Transducer positioning and essential sonographic bony landmarks will be reviewed and scanning in two orthogonal planes (both long and short axis of the structure) will be emphasized. With advances in technology, cost reduction, and easy availability, it is expected that more and more clinicians will be utilizing ultrasound in their clinics in management and treatment of rheumatologic diseases. The diagnostic ability of MSK ultrasound is based on an operator's training and experience, the patient's habitus and aptly chosen clinical indications. A good grasp of anatomy, sound ultrasound technique, and knowledge of limitations of ultrasound modality is essential for a safe ultrasound practice. It is also important to keep in mind that ultrasound provides limited information about internal structures such as meniscus and cruciate ligament pathologies and it has a complementary role with MRI. Ankle and foot are frequent joints to be involved in arthritis. These joints, being superficial in nature, can be easily accessed by ultrasound. Other advantages of ultrasound are its easy availability, portability, and repeatability. Tenosynovitis, synovitis, tendinosis, bursitis, and enthesopathy are common findings in inflammatory arthritis, which can be easily evaluated by ultrasound. Follow-up and treatment response can also be evaluated with less cost to the patient. High-frequency (7–15 MHz) linear probes with availability of color and power Doppler are ideal for scanning the ankle and foot. Systematic evaluation is the primary requirement for a proper assessment. Ankle is evaluated compartment wise with specific positing for anterior, posterior, medial, and lateral compartments. Foot is evaluated according to the midtarsal joints and metatarsophalangeal and interphalangeal joints. Structured base evaluation of the compartments and joints should be done and the pathologies were noted. Thus, ultrasound of the ankle and foot is a very useful and easily available modality for identifying and distinguishing different rheumatological pathologies such as tendinitis, tenosynovitis, synovitis, bursitis, and enthesopathy of the ankle and foot. There has been a major sea change in the care of rheumatology patients with the advent of bedside ultrasound (US). US not only offers an ionizing free form of imaging but can also evaluate the vascularity of structures without using contrast. Sonography has generated much excitement with the depiction of disease processes affecting anatomical structures, and in some cases, has changed our views of the pathophysiology. It has also enabled establishing the diagnosis when the clinical picture is unclear. In this article, the role of US in major rheumatic syndromes will be outlined with high-quality sonographic images. Musculoskeletal ultrasound (US) is rapidly becoming a very friendly and useful modality in the evaluation of musculoskeletal complaints. Whether it can compete with computed tomography/magnetic resonance imaging as a gold standard is entirely a different discussion; what needs attention is that, especially when dealing with pediatric population, how it transcends the fine line of disadvantages over other cross-sectional modalities to become a faithful, well-serving, bedside, outpatient, inpatient, point-of-care tool. Childhood trauma, inflammatory pathologies, congenital malformations, and infective foci are more amenable to US today, and our growing awareness about the applications of this modality is creating the possibilities of early detection, confirmation, and without delay in treatment as a one-stop shop. Musculoskeletal ultrasound (MSUS), once a sole territory of radiologists, has over the past decade been increasingly exploited by rheumatologists in clinical practice and as a research tool. Technical expansion in the field of ultrasonography has made MSUS a powerful tool in the early identification of inflammatory and noninflammatory rheumatic disease, monitoring disease, predicting therapeutic responses and guidance for procedures such as diagnostic fluid aspiration and peri- or intra-lesional therapeutic injections. US can be performed readily in the clinic, with an assessment of multiple joints at the same appointment, providing a “one-stop” answer to many MS problems. MSUS is widely accepted as an adjunct to clinical examination among rheumatologists in Europe and is rapidly gaining acceptance in the United States. In India, US is under the purview of the preconception and prenatal diagnostics techniques Act, which does not acknowledge the multiple role of point-of-care ultrasonography. 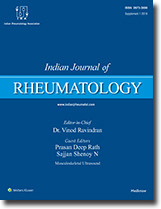 There are some other critical issues of equipment costs, training and certification and the relationship of rheumatologists and radiologists in advancing the field of MSUS in India. High-resolution musculoskeletal ultrasound (HRMSK US) has evolved tremendously from being performed in dark lit scanning rooms to being done at a remote setting, being one of its kind of modalities where live streaming is making remote diagnosis possible; like self-scanning by an astronaut in outer space, or, an on field assessment of an acute injury in a high-stake football match , or a hand-held device used for scanning at a remote location, with the images streamed over the net for interpretation. It began as gray scale imaging; however, as power Doppler came into practice, it gave a leap to the use of ultrasound in inflammatory arthritis. Three-dimensional power Doppler, beam steering, sonoelastography, contrast ultrasound, and fusion imaging are the new weapons in the armamentarium of MSK US. The role of MSK US ranges from detecting various changes in rheumatological diseases; be it active synovitis, bony erosions, enthesitis, assessment of crystal deposition, salivary gland changes, and vessel changes, aiding in diagnosis, especially in children. HRMSK US has an established role as a diagnostic tool, both as a primary modality and as an adjunct to other modalities in orthopedic practice and sports medicine also, and has evolved as a primary therapeutic tool in these fields, be it pinpoint-guided steroid injections, platelet-rich plasma injections, and barbotage of calcium deposition in situations such as calcific tendinitis. Even with all these advantages, it is still sparingly used in the practice of rheumatology in India. The authors believe that it is likely to be more widely used in the future given the enormous scope of its applications.